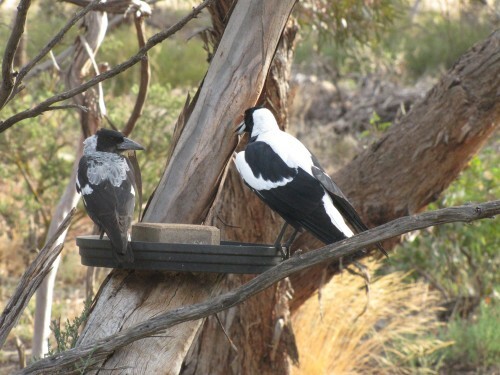 We have quite a few resident Australian Magpies in our garden and on our five acre property. Every year we watch out for nest building time to see which tree they will use; sometimes they refurbish an old nest. In the hot weather anything up to 6 or 7 of them gather under the shade of our back veranda, often crouching under the easy chairs we have there for extra coolness. The sun in the open on hot days can be as high as 50C or more, while under the veranda it can be 10 degrees cooler – which is still very hot! Our bird baths are also very popular with all species. Most smaller birds tend to fly off when the magpies occupy the cooling water. In the photos shown today, the bird on the left is a juvenile, possibly a female. The one on the right is a mature male. Hi My boy found a Magpie in refuse, it could not fly, we took it to our local Veterinary Clinic to check its wing and leg, it has a problem and they said it may never fly properly. She is still with us, she has been living unsecured at our property for nearly a year, she roosts in the patio, feeding, singing and calling other Magpies that visit. A neighbour said it should not be in captivity, she is not; she roams freely and seems healthy other than pulling feathers from the damaged wing. The neighbour’s cat tried to get her once, our dog saw the cat off, the magpie seems to fend well with this cat now too. Is she allowed to stay at ours, do we need a license for her?